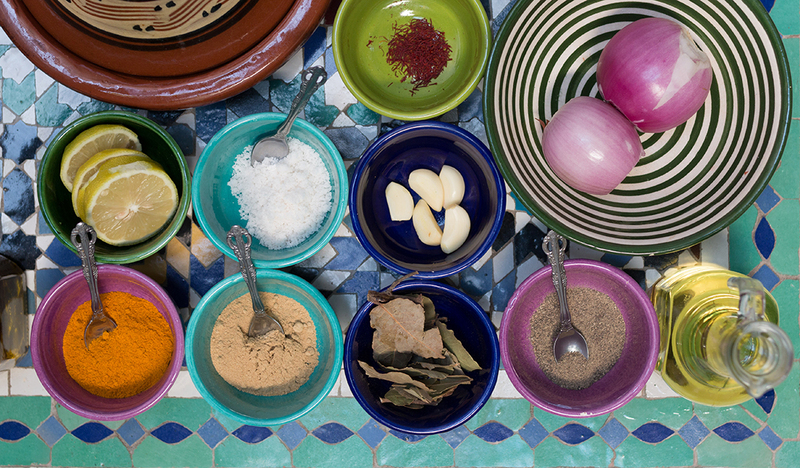 Morocco is famous for its spices. The leaves, flowers, bark and tubers can do far more than aromatize. For instance heal, revive or even turn on… A fast tour through some of the must-have spices for a 1001 night cuisine. Some describe its taste as soapy. In fact, the aroma is determined by various aldehydes that are found in in soaps in similar forms .In Asia coriander is an indispensable part of curry mixtures, in North Africa, it spices up sauces, soups and tagines. In addition, the herb is supposed to kill germs. So more of it, please! The spice is considered “typically Arabic” as and has a distinctive aromatic flavor. Friends of oriental fast food, mainly Falafel, know its taste very well. But also in couscous, rice and vegetable dishes this spice is not to miss. This tuber of the ginger family is a miracle! It is considered as an antioxidant, anti-inflammatory, anti-microbial – and cancer-inhibiting foremost. Curcumin also catches strong radicals and is the perfect anti-aging spice. Turmeric does not only keep you young and healthy, but also good mood. The yellow powder gives meat, fish and pasta dishes a sunny color. Nevertheless, don’t put too much – otherwise it will turn bitter! In Arabic Ras el Hanout means as much “ boss of the (spice) store”. Only he would know the incomparable blend of up to 25 spices like nutmeg, rose petals, cardamom, cinnamon, anise and chilli. Especially when the Moroccan national dish – couscous – the spice mix can unfold its magic very well. The most expensive spice in the world … Yes, yes – we know already. Besides its exquisite taste Saffron can revive the spirit. Saffron is earned out of the the flowers of a crocus. Grind it, soak in a little bit of warm water, then add it to the food.